After looking at this card for a few minutes today something jumped out at me. I saw the crown on the tip of the sword which made me think of the King of Swords. 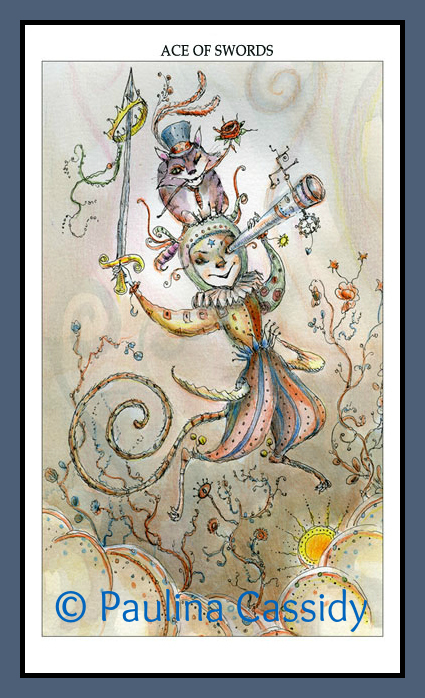 If the Ace is the beginning of a cycle, a new idea or fresh inspiration and powerful energy, and the King represents mastery and success at achieving goals, then the nod to the King in this card brings to mind the phrase, "If you can dream it, you can achieve it." For about a minute today I let myself feel bad about not having achieved certain goals in my life. I had that familiar feeling of resignation while telling myself this is it. This is my life. No point in reaching higher, might as well accept the status quo. It's not a bad status quo, after all, could certainly be worse. I shrugged that off and reminded myself of other women decades older than I am who were still growing, leaning, and doing amazing things. Today I'm letting myself dream.